Power supplies have been restored to all NIE Networks customers after Storm Doris caused power cuts in homes across Northern Ireland. The company said about 23,000 homes were left without electricity on Thursday due to the storms. It said trees and branches falling onto overhead electricity lines was the main cause of the damage. 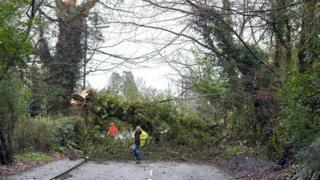 A number of roads were also blocked by fallen trees. Video What is a weather bomb?